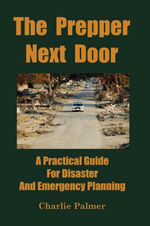 The Prepper Next Door was recently reviewed by David Nash on his PrepperBookShelf.com website. He wrote, “This book is jam packed with information.” Read the rest of the review here or watch the video review. Many preppers will be familiar with David and TNGun.com. That’s a great site I forgot to include in my resource section. He is working on a new book, which will list about 50 projects that will help preppers become more self-sufficient. Based on TNGun’s solid videos on Youtube, I know this book will be a great addition to a prepper library. One of my favorite preppers on Youtube, Demcad, reviewed The Prepper Next Door. I must say I find it very cool to see preppers I’ve watched for years on Youtube reviewing my book! I’ve already begun working on a revised edition, to incorporate some of the improvements suggested by other preppers. Primarily, I want to add sections to make the book more readable. One thing didn’t go so well. I wanted to shorten the 60 or so page chapter about guns. I started working on that goal, and it’s now at about (I’d guess) 70 pages. There were a few topics I decided to add, and I think they were good additions. In the section about stopping power, I’m adding a bit about bullet penetration. Years ago gun testers shot various pistol bullets at pine boards to see how deeply the bullets would go. Something that surprises many people is that the 9mm 115 grain FMJ bullets penetrate about twice as far (about 9 inches) as the standard 45 ACP 230 grain FMJ. Logically, this makes a certain sense. It takes a lot more energy to make a bigger hole! This doesn’t mean that the 9mm is superior. But it has certain implications. With the Internet today, we can find sites that test this sort of thing. One interesting site is theboxotruth.com. The idea being that the box is a ballistics box designed to test bullets. Few of us want to waste good pine boards or other material testing bullet penetration. A test of different calibers against Level III body armor. Shooting at stacks of books. A test of shooting at an engine block. (Not a particularly safe idea) They also shoot at locks, like you see in the movies. These guys have way too much time on their hands. One warning. I clicked to visit the theboxotruth online discussion boards to see what people were saying, and my PC gave a warning that their boards might be infected by malicious spyware. I’d stay away from those discussion boards for now. Unfortunately, malicious hackers can spoil things for us, because they want to load crap onto our computer to try to steal from us. They often target discussion boards on legitimate sites. All preppers should devote some time to learning about online security and to protecting their computers from malicious hackers. Here’s a site that will test the integrity of your installed firewall : (grc.com) Shields Up! We must be careful about online scans that claim to be spyware scans. Some are legitimate, but others are spyware. It’s a shame we must waste our time with this sort of thing, but it’s just one more aspect of prepping: Learn a bit now and save yourself potential problems in the future. Think for a minute about how much of prepping is learning to protect ourselves from malicious idiots and the ethically and morally challenged. Sans them, prepping would be *so much* easier.